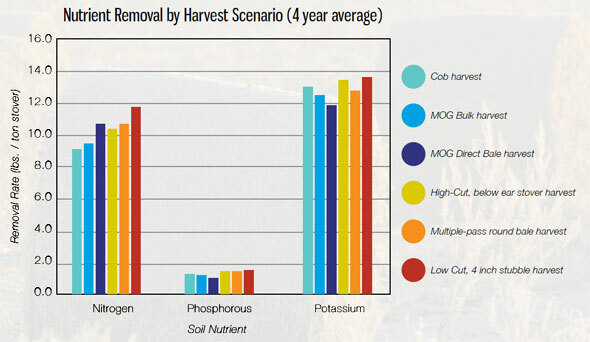 Latest soil research data affirms that biomass harvesting can be a good fit for many farmers. Soil research continues to demonstrate that POET-DSM Advanced Biofuels’ process for harvesting corn cobs, leaves, husk and stalk is a responsible part of good farm management, leading to no decrease in corn yields and minimal increases in fertilizer applications. Researchers with Iowa State University and the U.S. Department of Agriculture have finished compiling results from the fourth year of stover harvesting and soil analysis on fields around Emmetsburg, Iowa. The research has been commissioned by POET to ensure farmers have hard data to help them decide whether and how biomass harvesting fits into their operations. “Basically, at the removal level that POET recommends, there is no reduction in yield at all, and removal rates are well within the sustainability limits,” says Dr. Stuart Birrell with Iowa State University. That data affirms what the other three years of research have demonstrated, and it reflects what has been shown in data from other sites in the Midwest, Birrell said. 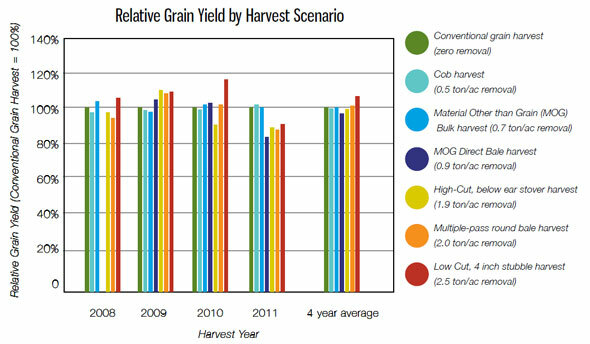 Grain yields remained strong on fields where stover was harvested in 2011, according to Dr. Stuart Birrell with Iowa State University, a lead researcher studying the effects of different harvest methods on soil nutrients. The “direct bale” method saw a variance in the latest round of data, but that was attributed to a change in the combine and operator for those acres. That’s good news for POET-DSM Advanced Biofuels, which will need about 285,000 bone dry tons of biomass per year to operate its first commercial cellulosic ethanol plant – Project LIBERTY – scheduled to come online in late 2013. The latest research summary indicates that a removal rate below 2 tons per acre is sustainable on similar fields with an average yield of 175 bushels per acre. POET’s contracts with area farmers call for removal of about 1 ton of biomass per acre. Over the last four years, corn yields on sites where biomass is removed have been typically +/- 2% of the yield on the site in which only the grain was harvested. In some cases, there has been a yield increase, especially with the higher removal rates of 2-2.5 tons per acre. Within each ton of biomass harvested according to POET-DSM Advanced Biofuels’ recommended practices, there is about 10.6-10.8 pounds of nitrogen, 1.2-1.6 pounds of phosphorous and 11.9-13.5 pounds of potassium removed. This chart shows the nutrients contained in the corn cobs, leaves, husk and stalk gathered from fields under the different harvest methods. The numbers do not necessarily represent what needs to be replaced in soil. For instance, with less crop residue on the ground, less nitrogen is consumed by microbes breaking down the material. Consequentially the data has not shown a need to increase nitrogen application. POET recommendations are for 10-15 pounds of potash where soil tests indicate it is needed. However, that doesn’t mean the soil is losing the same level of nitrogen, Birrell says. In order to consume the crop residue, microbes use nitrogen from the soil. With some of the biomass removed, there is less material to decompose. “We haven’t really seen that it’s necessary to increase nitrogen, based on more than 5 years of data at POET and other research sites,” he says. POET has recommended to farmers the addition of 10-15 pounds of potash where soil tests indicate it is needed. As always, Birrell stressed that farmers should know their own fields and do soil tests to understand proper fertilization rates. It is important that a producer have a strong fertility testing and nutrient management program before implementing crop residue harvesting. “The natural soil fertility and understanding of that fertility is far more important and has a greater effect on fertilizer recommendation rates, than the relatively small amounts you’re taking off in stover harvesting,” he said. POET Biomass Logistics Director Adam Wirt says the team in Emmetsburg has made sure that these recommendations are in the hands of producers. “The farmers here are very interested how their fertilizer applications might change due to biomass harvesting, so we’ve had a team of people out getting data into farmers’ hands,” he says. Birrell said there is no significant effect on soil carbon from biomass harvesting. “Soil carbon is more an effect of overall yield and tillage intensity,” he says. “In fact, you may be able to compensate for stover removal by reducing tillage intensity, which would significantly reduce tillage carbon loss,” he says. Doing that could lead to a net gain in soil carbon, he says. The researchers will be analyzing deep core samples for more data on carbon, but based on what he has observed as far as soil organic carbon over the last four years, Birrell doesn’t expect to see any significant change from Year 1. The 2012 biomass target is 85,000 tons, as Project LIBERTY steps up harvesting efforts ahead of the planned 2013 plant startup. Wirt says the latest round of research will help farmers remain confident that selling some of their crop residue for cellulosic ethanol is a sound choice for their farm.